Most automotive machine shops will have a small assortment of grinding wheels available, with varying widths, so that they may grind narrow V6 journals and wide V8 journals. For industrial crankshafts, which normally have a 1/8” radius or larger, a wheel is normally reserved specifically for these types of industrial grinding operations. You may view a typical crankshaft grinding wheel by looking to the picture at your left. Although the face of this wheel is mostly used for grinding, you will see that the sides have directional grooves. These grooves help to grind thrusts or to grind additional side to side clearance in main or rod journals that have been welded. Crankshaft grinding wheels are not only available with various widths, but they also are designed for machining journals that have different hardness ratings. Typically, a 35 RC rated wheel will grind most crankshafts including those made of cast iron, forged steel and nodular iron. Special wheels are also available for plunge grinding and those operators who sweep the journals to their finish dimension. For example, grinding wheels that are used for sweeping operations often have a built-in recess to avoid hitting the counterweights when the wheel is near the radius. For the crankshaft grinding wheel to be used on the machine, it must be attached to a hub (pictured right). The hub has a forward and rear section that interlocks the grinding wheel when the hub is locked into place with a series of bolts. The hub essentially squeezes the wheel so that both the hub and grinding wheel rotate as one piece. As you can see in the picture, the hub also has a keyway built into it to fit precisely over the crankshaft’s arbor. This helps to prevent the hub and wheel from spinning on the arbor during crankshaft grinding operations. Since most grinding wheels are rather large and heavy, which may exceed 22” in diameter and 50 lbs in weight, it is necessary to balance the wheel before it is put into service. 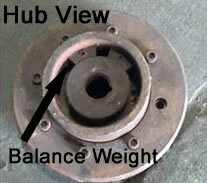 In the picture above you will see an arrow pointing to the hub’s balance weights. These weights may be positioned on the hub to balance the wheel and hub assembly so that vibration is reduced at high RPMs. Balancing is necessary as vibration during a grinding operation can result in chatter on the journals, degrade the quality of the surface finish and diminish the life of the engine’s bearings when used. Balancing the crankshaft grinding wheel and hub assembly is performed with a static balancing operation. A special stand, with rollers on each end, is used for balancing. When a balance shaft is secured through the hub, it may then be positioned on the balancing stand for static balancing. Normally using a marker, the automotive machinist will mark the light points of the hub as the heavy side rotates to the down position. The hub balance weights are then adjusted or added as needed so that the grinding wheel and hub assembly does not drop on the balance stand while positioned at any degree. 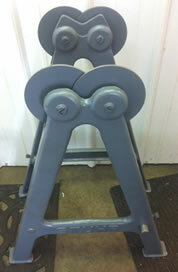 You may view a picture of a crankshaft balancing stand to your left. With the hub securely affixed to the crankshaft grinding wheel, and this assembly properly balanced, the wheel is now ready to be put into service. Once the new grinding wheel has been secured onto the crankshaft grinding machine’s arbor, and all safety devices properly set, the operator then must turn on the machine and dress the grinding wheel and radii using a diamond dresser. After the wheel is properly dressed, it is now ready to be put into production and can be used by the machinist to grind crankshafts. 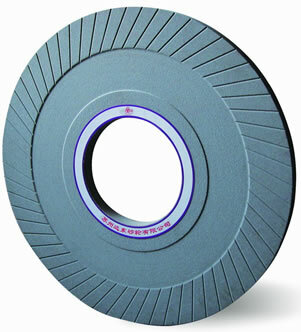 If you found this information about crankshaft grinding wheels useful, please consider rating this information below. Our goal is to provide vehicle owners with accurate and in-depth information, and your rating will help us to improve this page.